SHORT-STAFFED fire stations could be forced to close their doors as the service looks for ways to fund state government-imposed budget cuts. Up to eight stations out of 70 in Sydney could be left unattended at any one time, sources suggest, with firefighters warning yesterday the unprecedented austerity measure would compromise community safety. 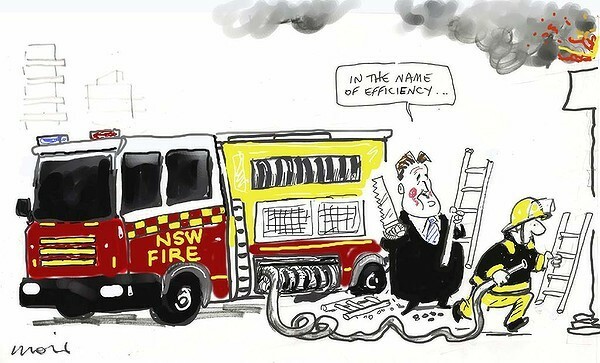 Fire and Rescue NSW is being forced to make savings after the Treasurer, Mike Baird, reduced its wages cap by $30 million over the next four years, according to Treasury forecasts. More than $5 million has been cut from overtime and temporary staff in 2012-13 alone. The cuts equate to 260 staff – about 6 per cent of the 6900-strong workforce. But The Sun-Herald has learnt Commissioner Greg Mullins intends to fund the shortfall through a crackdown on overtime and absenteeism before redundancies. One option being considered is temporary closures of stations hit by sickness or unplanned absence. Instead of funding relief staff, firefighters would operate out of the nearest station during that shift. Fire and Rescue confirmed temporary closures were among the options being considered but insisted the service had sufficient operational muscle to move resources around the state’s 339 stations without affecting safety. But the secretary of the Fire Brigade Employees Union, Jim Casey, rejected that. ”It will clearly impact community safety, response times will blow out,” he said. This will worsen the bad blood between the O’Farrell government and firefighters. While police, nurses and teachers have been ringfenced from job losses, firefighters have not been afforded the same protection as the other ”frontline workers”. Firefighters recently forced the government into a humiliating backdown on plans to strip them of workers compensation conditions after hundreds of them went on strike, blockaded Macquarie Street and sprayed Parliament House with a hose. Mr O’Farrell was livid at their actions, with police considering charges against the officer in charge of the hose. However, The Sun-Herald understands no formal charges will be laid, though the officer may still face an internal disciplinary hearing. The Opposition Leader, John Robertson, said the community should not have to accept reduced emergency services for budget cuts. The Labor opposition has also taken aim at the near halving of funding for advertising from $584 million to $320 million.